Reading this book was like sitting down with a crowd of girlfriends for a long-delayed get-together. In Butterfly Barn by Karen Power, Ireland leaps off the page, present in the speech of the characters, the scenery and the ‘feel’ of the book. This is an easy book to read in that the pages turned quickly, but it deals with difficult topics: infant mortality, grief, betrayal, guilt. Like many Irish authors, Karen Power writes with a connection to the Catholic faith and – though I am not in the least bit religious – this did not interfere with my enjoyment of the tale. It is a women’s novel, about women, their strength, their suffering, their mutual support and above all the way they deal with what life throws at them. On a transatlantic flight, Grace gets talking to the lady in the next seat. A friendship is forged which sees them re-united in Bayrush, Ireland, where Grace’s best friend Jessie is expecting twins. Grace is engaged to Dirk and all looks happy, until Jack – a teenage crush – returns home from Dubai. This is the first of a series of this wide cast of characters, at times a little too wide for me. I admit to losing track of some of the more distant relations of Grace, Jessie and Kate, but I look forward to the next instalment. 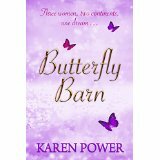 For more about Karen Power’s Butterfly Barn series of books, click here for her website. I thought Karen did a wonderful job of pulling the story and the characters together in this heartwarming novel of love, grief, friendship, and family ties. I reviewed Butterfly Barn in mid-June. http://michelleclementsjames.com/2015/06/15/butterfly-barn/. I am definitely looking forward to the next book.